"As soon as he walked out, he gave a little neigh." This old horse, named Copper, is lucky to be alive - especially considering the very, very unlucky situation he found himself in this week. 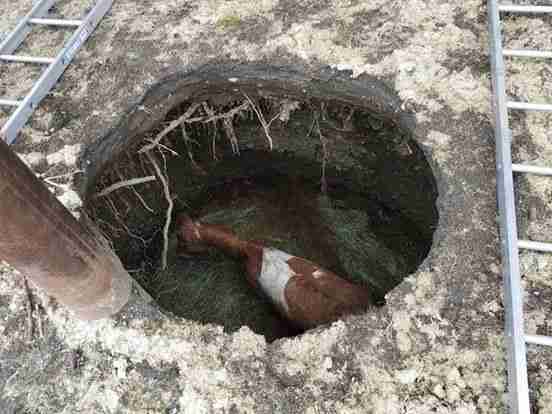 At some point on Tuesday, Copper was hanging out in his Kittitas County, Washington, pasture when the earth beneath his hooves gave way. 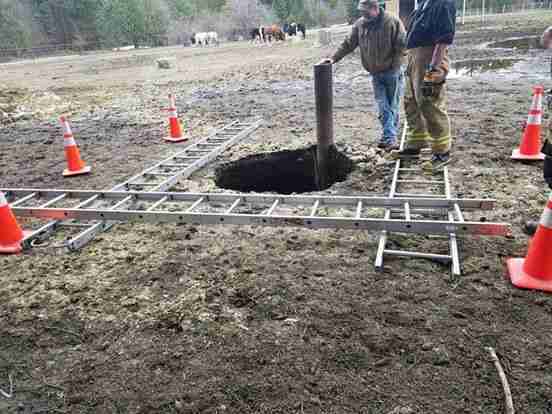 In that moment, the horse found himself suddenly at the bottom of a 15-foot-deep sinkhole. From a distance, it might have looked like Copper had simply vanished - but fortunately, his ordeal didn't go unnoticed by his owner, who called for help. 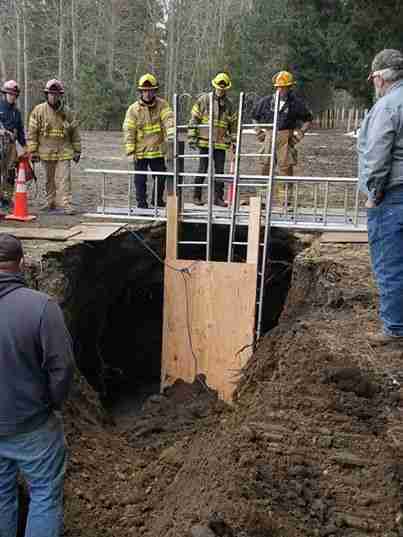 Soon, a crew from Kittitas County Fire District #7, along with a team from a local excavation company, was at the scene to assist in Copper's rescue. His veterinarian, Dr. Sam Taylor, was on hand, too, to make sure the horse remained safe throughout the extraction effort. She even descended into the sinkhole to give Copper a mild sedative to keep him calm. 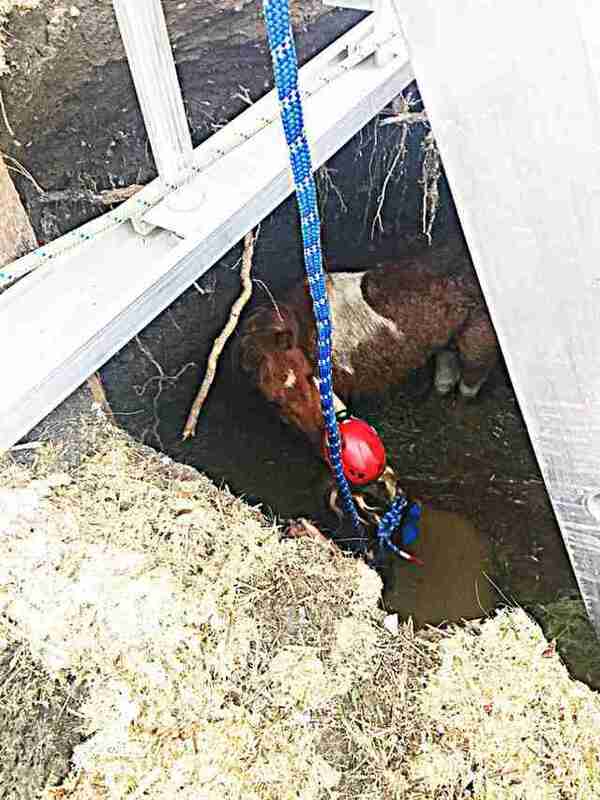 Rather than attempt to hoist poor Copper out of the hole's narrow opening, rescuers instead decided to dig out a trench so the horse could walk out on his own. A board was placed over the opening they were making to protect Copper during the digging. After about two hours of laboring, the rescuers' hard work paid off. Here's the moment Copper walked free out of what easily could have been his early grave - appearing a little shaken, but happy to be alive. People who helped Copper out of the hole clearly weren't the only ones who had been concerned about him. "As soon as he walked out, he gave a little neigh, and the horses that were in the pasture as well. They all ran together as a little herd and came over and check on him," a spokesperson for the fire department told the Daily Record. "So it was amazing."